Photographer unknown. Collection of Sidney W. Newton. A gathering of a bicycle club in the late 1800s, from page 39 of Early History of Independence, Oregon. 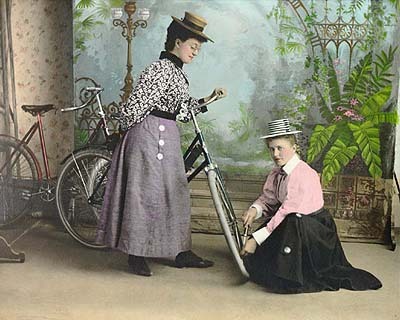 circa 1900 Misses Palmer and Severud and their "wheels" in Milton, North Dakota early in the 20th century. One steadies the handle bar and the other pumps air into a tire. Both are properly dressed as ladies of the day. "There is one colsolation a man has in living in Corvallishe can live to be an old man for he will never die of excitement. There is not enough of it here to ever be of any danger to a man's constitution." 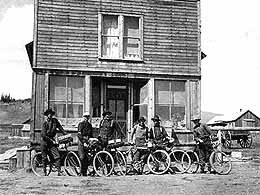 Members of the Breckenridge Volunteer Fire Department pose with their safety bicycles during a trip to Kremmling, Colo., circa 1900. They have bedrolls and boxes tied to their handlebars.